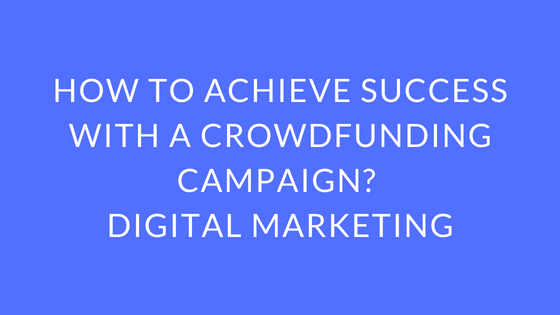 Digital marketing has become the forefront of business success in the modern world, this is the same for any crowdfunding success you are hoping to achieve. Big success comes from big investments, for campaigns that have achieved a seven figure funding from backers have almost all spent upwards of $50,000 on digital marketing. The main goal of any online marketing is to maximise leads, whilst minimizing costs, but being able to do this comes from testing, testing every angle of your product, and knowing what works, inside and out. A crowdfunding campaign is most likely the first time you are introducing the world to your product, you have zero brand equity or customer loyalty. Which means that you have no idea how customers will react to it, and the best avenue for you to advertise your product on. Making assumptions on content and strategy can be the downfall of your company, opinions can be wrong, but evidence about audiences and their responses can’t be. If you don’t learn as much as possible before launching your campaign, it can all go horribly wrong. Advertising is all about hypothesis base testing, by running the right tests, from the right queries, about the right audience, you will gain some very valuable data, and data driven advertising is essential for crowdfunding success. Below are the three most important things for you (or the agency you hired) to test. Know who they are, male? Female? Location? Age? Don’t even attempt to build your campaign around an assumption. Put theories to the test, find out everything you can about the people who are attracted to your advertising. Facebook as a digital advertising channel allows you to learn everything you will ever need to know about your targeted audience. Grab this information and use it! It is gold dust, design your advertisements to those who are proving themselves to be attracted to them already! The advantage is that you get to do this all before you push the majority of your marketing budget into getting you those O’ so precious leads. Knowing your customer will let you proceed with confidence into the next phase. Your marketing is your statement of your story. Headlines are hooks for potential backers and make them want to know more. Digital marketing gives your company room to play with copy and creative. Finding out that your copy and creative isn’t good before you spend all your money on it is essential, it allows you to not be so precious with your advertisements and tweak them to become lead generating machines. Positioning comes down to the story you are telling, being able to express it properly, in the fewest words, and at the fewest costs. The best story is one that the audience reacts positively to. Your most fundamental messaging is your marketing statement, and marketing message. It is your goal (or your agency’s goal) to figure out what these should be. It is a systematic testing process where each test deepens the understanding. McDonalds like many other larger than life brands have spent billions on their brand image and establishing a room in your mental real estate. They want to build association between images, feelings and their brand. That’s what you, or we, want to do. The creative is no different then the demographic or the positioning, it needs to be tested through digital marketing . Your backers brains are prime real estate that you can own through brand association. Make them think of you when they see, hear or feel something. Test the waters with multiple ads of the same copy, but different images, get specific, if a different image with the same copy gets more engagement, don’t stop there, change the background of the image to see if you can get it cheaper, with the same engagement. Most importantly. Always be testing. When you know what Demographic works best, what Positioning works best, and what Creative works best, you’ll have the winning combination.